If you are providing real time information to your call center stakeholders (Agents, Team Leaders, Managers and Senior Management) congratulations you are making your call center more effective and efficient. On average Spectrum Call Center customers report a 7% increase in productivity by implementing a Real Time Reporting system in their call center. There is more that can be done to further improve your call centers efficiency and effectiveness and without having to spend any money. Today’s call centers that are using real time reporting have taken a crucial step towards improving the overall performance of the call center. Agent and group real time KPI’s and statistics for the day are displayed prominently about the call center and on agent desktops. This information helps the agents make better and faster decisions and to stay within reach of their goals. Of course one challenge that exists for the agents is remembering what the goals were for each of the groups or skills they are logged into. Thresholds are set by managers to remind agents and team leaders when stated metrics are not being achieved and to assist them with a nudge to meet the stated goals. But lack of details does not help the team perform better in the long run. Details, such as what the service level, customer satisfaction (CSat) and abandonment rate suppose to be for my group(s)? Or how much over threshold am I and my group? Are the thresholds accurate for the time of day and day of week? Messaging is used very frequently in call centers. Targeted messages to an agent and to groups of agents are very effective to show appreciation, remind agents to stay on task, and to provide a gentle push in the right direction. However, messages that are not specific enough or leave the agent wondering about the message are not effective and can even be counterproductive. Messages need to be clear and concise and easy for a busy agent to quickly understand. Messages that are vague can create an unproductive agent while they try to understand the message behind the message. Congratulations on exceeding your goals today. Which goals were exceeded? By how much? What was the goal? How did I do the rest of the week? Congratulations on exceeding your Customer Satisfaction Rating Goal by 8% today. This is the second time this week you’ve surpassed your goals! A slightly longer message that might take 5 seconds more to run and answers questions for the agent. This same type of methodology can be used on group messages that are displayed on LCD screens, wallboards, emails, etc. A short message may seem like the best way to communicate but it leaves too many questions open for interpretation. Extend the message with more information and the message becomes more effective. One of the reasons why Real Time Reporting is successful in a call center is the information presented to the stakeholders allows them to make immediate decisions to change their current behavior and respond to the current business situation. Too many calls in queue, long handle times, poor schedule adherence, declining CSat and FCR ratings all are improved by using real time reporting. To further improve efficiencies and effective behavior the real time reporting should be enhanced with information on goals and variances. With the addition of agent or group goals and variances a scorecard is created which stakeholders can now clearly see how well they are performing against the goals. To communicate this information to an agent the scorecard could be placed on the desktop and rotate between KPI statistics for the agent and the scorecard. By displaying goals and variances there is a reinforcement of the stated goals. If managed properly the agents would already be aware of what their goals are and would have had input into the goal setting. Then by displaying the goals the information would not be viewed as negative or being ruled by an iron fist. Real time reporting can be used in other ways to achieve your call center goals. A global product development organization had a current wait time for support exceeding one hour. The line to call on was a free call to the caller but still created a negative image with the customers. The organization determined they needed to reduce that wait time even though it was free support to less than 15 minutes. This was to be a long term plan and not something that could be fixed in a short time. One of the challenges was that the organization could not add additional agents to the free support line. Create a series of short term goals that were more achievable. Going from 1 hour to 15 minutes seemed to be too large of a hurdle. So each month the goal for average hold time was reduced by approximately 10 minutes. Continuously run a message on the agent desktops reminding them of the new goals. This program was a huge success and within the year the global support on the free support line was less than 15 minutes. Real time reporting is effective when used properly, the teams are involved in the decision making and obtainable goals are set and monitored. Messaging in the call center is the most requested feature of all Spectrum features. Managers require the ability to send messages to agents and groups of agents to keep them informed, make request of agents, remind agents, team leaders and groups of adherence issues, and in general provide a friendlier atmosphere for the call center. However most managers do not give the type of message they create and publish much thought. The following are actual messages sent to agents and displayed on LCD screens in call centers. Messages need to be clear and should not leave doubt in an agents mind as to its meaning. Messages should not threaten any one or any group. Messages must state who sent the message and why the message is being sent if it is not clear. Real Time reporting will also offer the ability to save your daily, weekly, monthly, etc. as statistics on a spreadsheet to be reviewed again in the future. If set up properly the daily reporting can be used to automatically notify an agent that they should set a time for training. 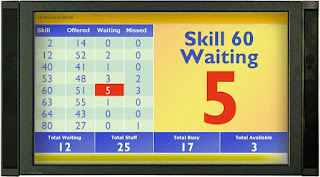 The scope of how and when to use analytics is beyond this newsletter, however, some ideas include: Use the reports to determine when coaching is required; use the reports to determine when training is required (coaching and training are two different tasks); use the reports for assistance in scheduling agents to work a difficult skill; use the reports to move agents to another skill group, use the reports to compare against current goals and use the reports for setting future goals. 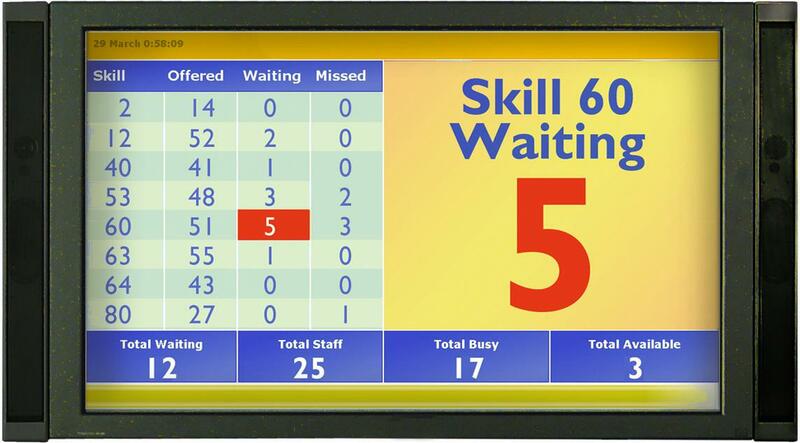 The value of Real Time Reporting is not limited to showing the current status of a skill group on a display. The true value of Real Time Reporting comes from a Manager setting the goals for the reporting tools and using them to their fullest capabilities. Often additional benefit can come from an existing system that is already in place. Contact Spectrum or log into our Specorp Website for more information on how you can expand your current real time reporting system.